The IRS has spent $96.5 million on office furniture under the Obama administration and is now claiming it has insufficient funding to adequately serve taxpayers. 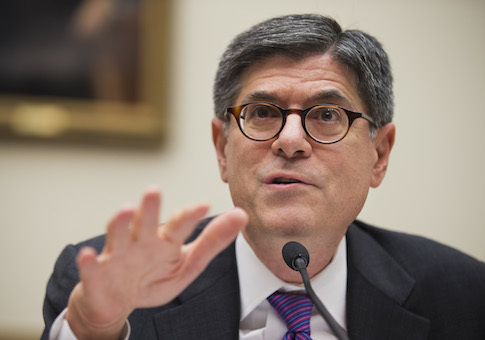 Treasury Secretary Jack Lew testified before the House two weeks ago about the IRS’ need for additional funding for the upcoming fiscal year. The IRS is currently seeking an increase of $1.2 billion—a 7 percent raise over its FY 2014 $11.29 billion budget. It would bring the agency’s FY 2015 budget to $12.48 billion. A review of contracts by the Washington Free Beacon shows the IRS in the past five fiscal years has spent $96.5 million refurbishing IRS offices across the country. Those contracts include fiscal years 2010 through 2014. That amount already exceeds what the agency spent during the entire eight years under President George W. Bush, fiscal years 2002 through 2009. The purchases during the current administration show contracts are for various amounts. They range from several millions to hundreds of thousands of dollars for each agency office. The first fiscal year budget for which President Obama was responsible was FY 2010 and it was a banner year—when the agency spent the most on new furniture. Records show $44.4 million was spent that year. The Free Beacon found in a total of 3,777 contracts he IRS has purchased various types of furniture. The contracts include new chairs, showcases, partitions and shelving, and wood furniture. A sampling from the volume of contracts includes the agency’s Lowell, Mass., office, which spent $5.04 million on showcases, partitions and shelving. The contract was signed in 2012 was completed on April 30, 2013. The Philadelphia IRS office spent $2.8 million for "furniture systems." That contract was signed in 2011 and the work was completed in 2012. Other IRS offices also had multi-million dollar makeovers. A contract in 2011 shows the "purchase of systems furniture" in the amount of $2.67 million for the Colorado office. The Washington, D.C., office received $2.6 million in "new system furniture/service" and the work was completed in 2012. Still another contract shows the Iowa office had a $1.08 million makeover. The contract did not detail the type of furniture purchased. Michigan, which has six IRS offices, has spent the most on furniture of all the states during this time frame. Its contracts include $1.57 million in taxpayer funds spent for its Leeward office, and another $1.36 million on its Zeeland office. While it is unclear what type of furniture was purchased for the IRS office in Jasper, Ind., records show two large purchases were completed just four months apart. One contract for $689,719 was completed in November 2010. Another contract for $805,515 was completed in March 2011. Contracts also revealed that hundreds of thousands of dollars were spent solely on chairs for the IRS’ office in Haverhill, Mass. The contract shows $618,881 was spent on "Task Chairs Phase II." That work was completed on Dec. 31, 2012. Due to the volume of contracts, the Free Beacon could not find the amount spent for Phase I of the task chairs project or if there were any additional phases after this second one. Another contract shows the agency’s offices in Seattle and Austin received over $1.1 million in new furniture. One contract for $810,200 and another for $327,908 were both completed in February 2013. The top three prime award contractors were Knoll, Herman Miller, and Haworth International. While some records did not give detailed information on the types of furniture purchased, the high-end retailers’ websites do give taxpayers a sampling of their products and costs. Herman Miller has chairs that cost $1,209, and storage units that cost $1,749. Knoll’s chairs retail for $659. Another company awarded several contracts claims on its website it partners with "best interior products manufacturers" in the industry. In his testimony, Lew said, "The IRS continues its commitment to carrying out its responsibilities, providing quality service to taxpayers and preserving the public’s faith in our tax system, but the lack of sufficient funding in recent years has made it difficult to provide the kind of services American taxpayers deserve." This entry was posted in Issues and tagged Government Waste, IRS. Bookmark the permalink.